Have you ever picked up a new instrument and tried learning to play your favorite song? Or found out exactly how much sour candy you can possibly eat in one sitting? Or given yourself permission to be friendly to a total stranger who looked sad? Ricky Dillon has, and in Follow Me, he invites you to join him on a series of challenges—from serious, contemplative tasks to hilarious, outrageous stunts—that are bound to stretch your mind (as well as your muscles) and change your life for the better. Sure, trying something new or putting yourself out there—facing the unknown—can be scary, but Ricky himself understands what it’s like to face life’s great obstacles. He also knows that every day offers chances to try something new, to push yourself a little farther, and to get a little stronger both inside out. 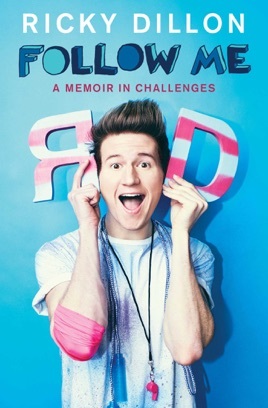 Along with the challenges, Follow Me also ushers readers into Ricky’s real life, sharing exactly how he creates his videos, what it’s like collaborating with other YouTube stars, what his family and friends mean to him, and how he juggles all of his creative endeavors—from music to fitness to writing and beyond—while keeping a positive attitude and appreciating all of life’s adventures, big and small. Inspiring, informative, and incredibly fun, Follow Me is not just a book but a full-on reading experience from one of our most beloved and hardworking social media stars.